@EIZOUK EIZO Limited announce the 23.5-inch FORIS FG2421, the world’s first #gaming monitor with a 240 Hz refresh rate. The FORIS FG2421 also features a low input lag and gaming preset modes that were developed with professional gamers to make it ideal for first-person shooter, racing, fighting, and other fast-action genres. The FORIS FG2421 comes with a new feature called Turbo 240 that surpasses the 120 Hz refresh rate of conventional gaming monitors. This high refresh rate along with a response time of less than 1 ms produces the smoothest image display available on a gaming monitor. This high contrast ratio increases visibility in dark scenes making it easier to spot enemies. Plus EIZO developed its own integrated circuit to minimize the input lag or the time it takes for commands from a keyboard, mouse, or controller to appear on the screen. Two color modes for FPS (first-person shooter) and one for RTS (real-time strategy) games are included. The FPS and RTS modes were co-developed with professional gamers from Fnatic, a leading eSports team, to provide ideal brightness, contrast, and gamma settings. Three fully-customisable modes for users who want to import and export their own settings are also built-in. EIZO is bundling its new software, ScreenManager Pro for Gaming, with the FORIS FG2421. This software lets users download gaming presets used by professional gamers from www.gaming.eizo.com or export their own customised colour modes to other gamers who also own the FORIS FG2421. To allow for using the full 23.5-inch screen, the user can enlarge the image while maintaining the aspect ratio or expand it to fill the entire screen. The FORIS FG2421 is designed to provide viewing comfort over long hours of gameplay. 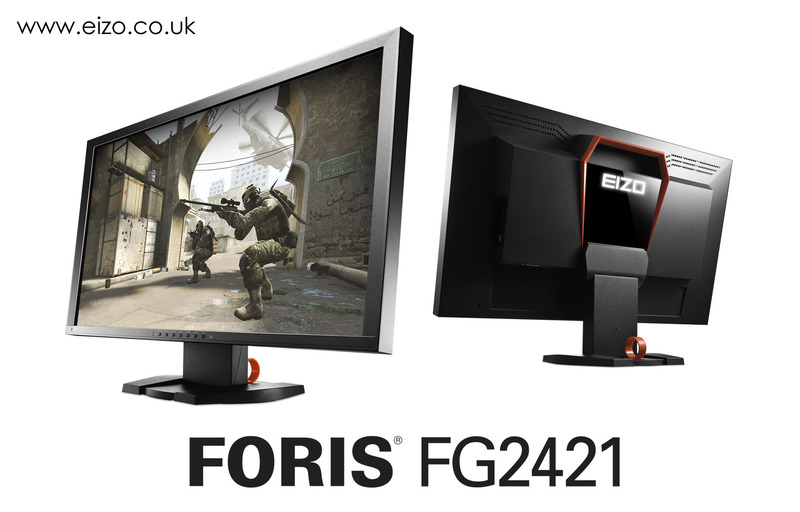 With the Turbo 240 set to off, the FORIS FG2421 maintains a refresh rate of 120 Hz and uses EIZO’s own hybrid technology for providing flicker-free images at any brightness level. A sensor on the front of the monitor detects the ambient brightness and adjusts the screen’s brightness to the ideal level which saves energy and prevents eyestrain. The sensor can enabled/disabled by the user. PLUS The FORIS FG2421 debuts a new cabinet design. The back of the monitor features an illuminated EIZO logo on a glossy surface that is surrounded by a vermillion frame. Above this frame is a handle for carrying the monitor to a LAN party or gaming event. For viewing comfort, the stand provides 60 mm of height adjustment, 25° of tilt and 344° of swivel. A cable holder contributes to a clutter-free desktop. The five-year manufacturer’s warranty2 ensures a long service life and is significantly longer than the three-year warranty of most gaming monitors. The FORIS FG2421 is now available. Please contact the EIZO subsidiary or distributor in your country for details. Industry leading display manufacturer EIZO partners with Light Illusion to enable high-end LightSpace CMS based calibration capability. Global monitor specialist EIZO Limited is pleased to announce its collaboration with industry leading display calibration software manufacturer Light Illusion. The manufacturers have successfully fully integrated Light Illusions LightSpace CMS calibration system into EIZO ColorEdge monitors, providing unparallel display calibration capability for colour critical application, with the addition of in-built LUT Management making the combination of EIZO and LightSpace CMS ideal for on-set Look workflows. The first finalist has been chosen and part 2 is launched this week. Anyone can vote, although at the moment, there are more votes in from the UK, let’s keep it that way! A bit of light hearted online distraction, but also the serious chance to win an EIZO monitor… or a tee shirt! The winners of the Miss EIZO May T-shirts will be notified within the next few days. Manchester and London now host three of the best EIZO monitors so photographers can put them through their paces. Offering unbiased product trials in two of the Calumet stores with the heaviest footfall, EIZO and Calumet are now able to invite photographers to learn about colour management, why a monitor makes a difference and to run their own images through the machines so they can see the difference for themselves. “The Calumet stores are perfect for photographers at any level to actually see for themselves the positive difference that an EIZO CG monitor will make to their pictures,” said Victor Aberdeen, EIZO ColorEdge Sales Manager. “Photographers often are put off by the technical stuff about monitors, but it is about the art, so being able to try them out for themselves brings the advantages into focus, showing photographers the detail ordinary monitors are hiding, which really benefits their images! VOTE FOR MISS EIZO 2013 AND WIN! Do you recall the legendary 2010 EIZO Pin-up Wall Calendar, which caused quite a stir internationally and made headline news? The exclusive gift from EIZO to radiologists featured 12 very special calendar girls – wearing nothing except their stilettos but without baring any skin! In response to the many enquiries we’ve received about the attractive EIZO pin-up girls and because we think they still look great, our calendar girls will now compete for the title of Miss EIZO 2013. And you are the judges! The first six girls are already lined-up, waiting for your votes. Cast your vote and, with a bit of luck, you could win one of our weekly prizes: a T-shirt featuring one of the finalists. 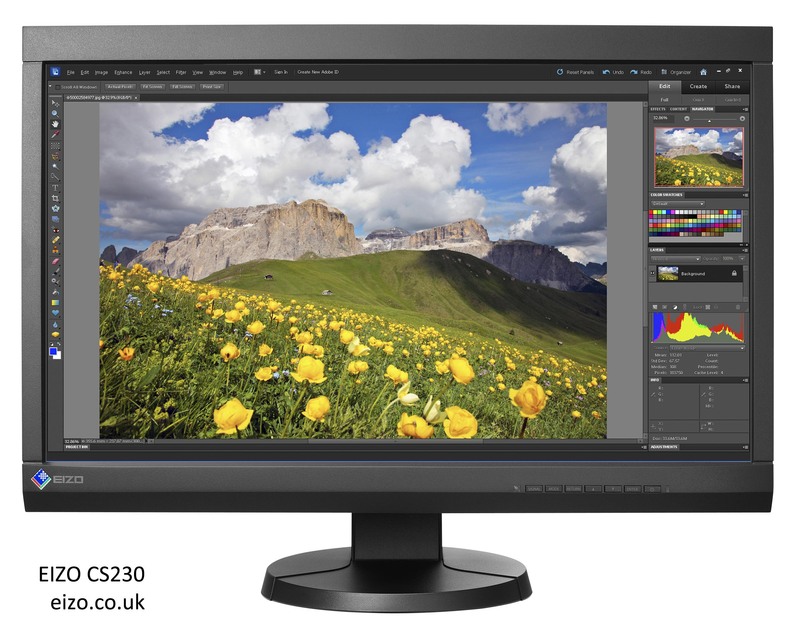 You could even grab the grand prize at the end of our competition: an EIZO EV2436W 24” monitor! Have fun! EIZO, the specialist monitor manufacturer is taking on the world of animation, has just commissioned one of Selfridges “Bright Young Things”, animation designer Katy Beveridge to work on a new piece of animation to help promote its ColorEdge range of monitors. 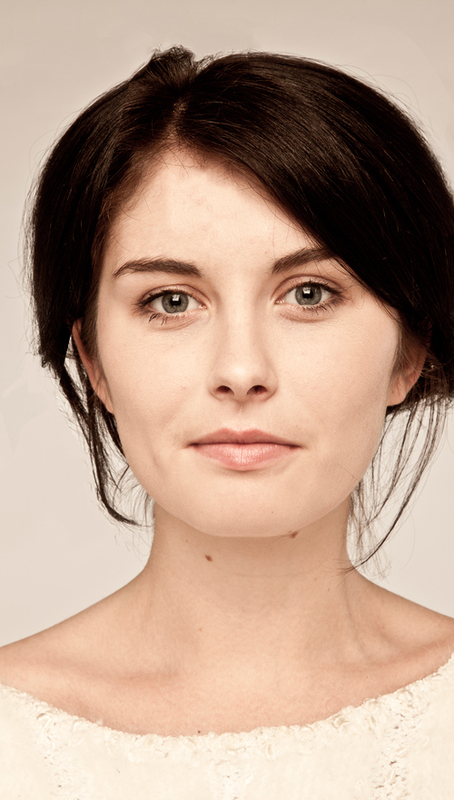 Katy Beveridge graduated with a first class honours from Central Saint Martin’s only last year and already her animation work has received the YCN Graduate Award, and been picked as one of Selfridges “Bright Young Things” championing the “most exciting young creators”. Her work has been exhibited internationally at film and Animation festivals such as Klik Amsterdam and the Toronto International Film Festival. Her graduate film “The Bicycle Animation” which used a bicycle wheel to create animated loops in real time went totally viral receiving over 1.5 million views and was featured on The Discovery Channel, The Huffington Post and The Atlantic. Katy’s work aims to challenge the conventional notion of animation, focusing on the process behind the animation above the narrative. Targeting serious photographers and graphics professionals, the plans are secretly under way, with the expected launch due Autumn 2013. All that can be said today is EIZO Limited is delighted to be working on the new project as part of its evolving campaigns with its extensive range of ColorEdge monitors. Watch this space!